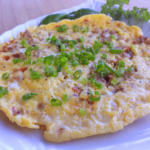 Tortang Giniling is an omelette stuffed with meat, tomatoes, and potatoes. It is best paired with rice, fried or steamed. It can also be a hefty filling for pandesal, bread buns, or loaf bread. Heat pan in medium heat, add oil, saute garlic and onion. Add ground pork and cook for 5 mins. Add tomato and cook for 1-2 minutes. Add potato, pepper and salt. Mix and cook for another 5-7 mins or until potato is well cooked. Pour beaten eggs and cook for 1-2 minutes. Flip and cook the other side. Sprinkle scallions and pepper. Serve and enjoy! Here is a step by step video of Easy Tortang Giniling Recipe.